In 1919 Samuel Briskman applied for a passport in order to travel to Japan and China on commercial business. Briskman was a silk merchant, and he was traveling to Asia to buy silks for his business. On his passport application Samuel Briskman declared that he was born in Kiev, Russia, 15 Sept. 1873, that he emigrated to the U. S. from Hamburg, Germany, May 1889 and that he became a naturalized citizen of the U. S. 27 May 1904. But today Samuel Briskman (1873-1967) is remembered primarily as the inventor of pinking shears, a form of scissors designed to cut a zigzag pattern instead of a straight edge. These are used by clothing manufacturers to cut cloth edges in a way that minimizes fraying. Briskman secured several patents for pinking shears in 1934, but by that time had already established a company to manufacture them several years earlier. Initially this was the American Pinking Shears Corp. at 158 Greene St., New York City. In 1933 this business moved nearby to 102 Prince St., where the business name changed to Pinking Shears Corp.
Briskman's obituary, New York Times, 16 Feb. 1967 reads in part, "Samuel Briskman of 880 Fifth Avenue, inventor of the pinking shears and president, since 1953, of the New York Cardiac Center in Yonkers, died of a heart attack Tuesday in Miami Beach. Mr. Briskman's invention, which he patented in the early nineteen-thirties, proved to be a revolutionary cost saving device in the textile business. The scissors with a serrated edge, cut a zig-zag course across the material which prevented its ravelling. . . . After obtaining a patent for the pinking shears, Mr. Briskman opened a small plant on Greene Street, called the Pinking Shears Corporation. Later he expanded the business in a 5-story factory at 102 Prince Street. . . . Besides his widow, he is survived by a son, Arthur; a daughter, Mrs. Harold Slote of Scarsdale, N. Y., and five grandchildren." The website http://jwissandsons.com has the following on Briskman, "Samuel Briskman, of Brooklyn, invented pinking shears in 1931 and received his first three patents for them in 1934. He formed the American Pinking Shears Corporation and opened a small plant at 158-160 Greene St, and then in 5-story factory at 102 Prince Street in Manhattan, New York. At some point the company name was changed to Pinking Shears Corp. His firm milled the teeth into the blades. Wiss made the actual shears and had the exclusive sales in the USA and through their agents abroad. Briskman was also entitled to sell abroad under the name Pinking Shears Corp. through his agents. Based on the number of pinking shears instruction folders printed in the 1950s, they were the boom years for pinking shears sales. He had one son, Arthur (Artie) Briskman, who worked with him. We have no idea what happened to them, but sales fell off after a change in the type of fabric that was popular (synthetics don't need to be pinked). And then serge stitching became common on sewing machines. Norman F. Wiss, Sr. (died 15 Sept 1954) was the one who pushed for and managed the agreement with Briskman." "The J. Wiss & Sons Co., Newark, N. J., founded in 1847, has established a worldwide reputation for the quality of its scissors and shears" (New York Times, 22 Nov. 1956). Norman Frederick Wiss (1895-1954) registered for the World War I draft in 1917 when he specified that he was involved in the manufacture of "bandages and surgical knives" at J. Wiss and Sons Co., 32 Littleton Ave., Newark, N. J. Prior to his involvement with pinking shears Samuel Briskman was a silk merchant in New York City. His first directory listing was in 1904, when he was located at 1272 Broadway. He had a partnership with Ferdinand J. Salomon from around 1913 to 1919, but otherwise was mostly in business for himself. His location from 1911 to 1922 was at 33 E. 27th St.
Tracing Samuel Briskman's residences in New York City from the time of his arrival, 1889, to the time of his death, 1967, I found 9 addresses in Manhattan, and only a single (and dubious) reference to a Brooklyn address (briefly in the early 1930s). The phrase "Samuel Briskman, of Brooklyn," would seem to be an unfortunate instance of somebody writing this on the internet, followed by dozens of others copying this mistaken information. This ad for S. Briskman & Salomon at 33 E. 27th St. appeared in American Silk Journal, Jan. 1915. This ad for Samuel Briskman at 33 E. 27th St. appeared in American Cloak & Suit Review, Jan. 1919. Yet another ad for Samuel Briskman at 33 E. 27th St. appeared in the Garment Manufactuerers' Index, Jan. 1921. 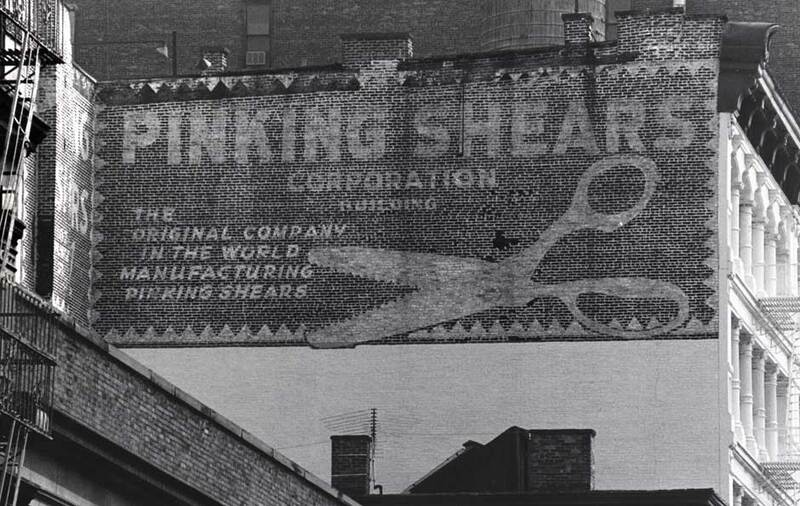 There is a photograph in the collections of the Museum of the City of New York showing the Pinking Shears sign. Dated ca. 1975, this is a photo by Edmund V. Gillon, Jr., who did the photographs in Margot Gayle's Cast-Iron Architecture in New York (1974).